A map supplied by Hecate Energy, LLC showing the proposed “footprint” of the approximately 3,400 acre Hecate solar panel electrical generating farm is pictured. The Ohio Power Siting Board hearing on the proposed Hecate Energy Highland solar panel electrical generating farm will be Tuesday from 6-8 p.m. at the Whiteoak High School Student Activities Center in Mowrystown, and one local couple has already let it be known how they feel about it. In a letter to the OPSB and the Highland County Board of Commissioners, Ken and Karla Bolser have come out against the solar panel farm, which is near the Gath North Road property the couple purchased three and a half years ago. The couple stated they have concerns regarding any ambient noise the facility’s inverters and transformers may make, the possibility of a decrease in property values and the fear that once the facility is fully operational, it would be nearly impossible to sell property located near it. The hearing, step number 16 of the 20-step approval process in the proposed solar farm construction project, will be to hear public comment and testimony from those both for and against the project, which would occupy about 3,400 acres of land north and northwest of Mowrystown, between Mowrystown and Buford. Dr. Evan Blumer, project director of the Appalachian Ohio Solar Job Network, said that public input at the Tuesday hearing will be limited to public testimony from those that are for or against the facility, the physical nature of the proposed Hecate installation only and how it relates to any adjacent properties and landowners. A similar hearing was held in February at Bright Local Elementary School near Sugar Tree Ridge regarding the proposed smaller Willowbrook 100-megawatt solar farm. According to a Notice Regarding Modification of Project Footprint, which was filed by Hecate Energy Highland on Feb. 20, an additional 95 acres was added to the proposed project. Following the Tuesday night hearing in Mowrystown, the next event in the application process is an adjudicatory hearing scheduled for March 26 at 10 a.m. at the offices of the Public Utilities Commission of Ohio in Columbus. 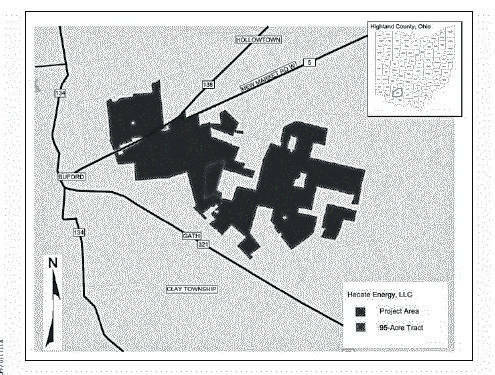 https://www.timesgazette.com/wp-content/uploads/sites/33/2019/03/web1_Hecate-map.jpgA map supplied by Hecate Energy, LLC showing the proposed “footprint” of the approximately 3,400 acre Hecate solar panel electrical generating farm is pictured. Courtesy Hecate Energy, LLC.